Book your flight ticket with airticketsindia.com & get Upto Rs 700 on international flight booking. Use Promo code "ATINT" to get discount on flight booking. Get Rs 300 on domestic flight booking. 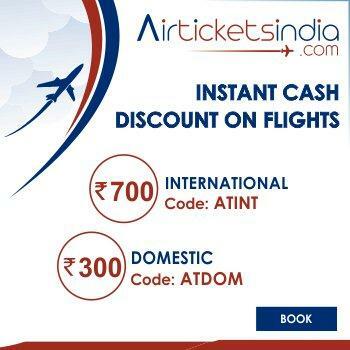 use code "ATDOM" to avail this offer on airline tickets for domestic flights booking. C – 101, Sector – 2 Noida – 201301 (U.P) India.